Astronauts Scott Kelly and Tim Kopra of NASA, and Tim Peake of the European Space Agency delivered a holiday message from the International Space Station on Dec. 18. The station Christmas tree can be seen just to the right of Kopra's head. The winter holiday season is well underway, and the astronauts aboard the International Space Station (ISS) are getting ready to celebrate in zero-gravity. 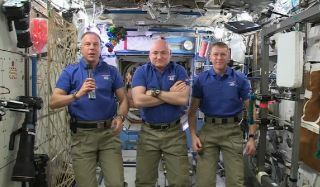 In a video message released on Dec. 18, Expedition 46 crew members Scott Kelly and Tim Kopra of NASA, and Tim Peake of the European Space Agency, delivered a holiday message from the station. The three men expressed their thanks to the "teams on the ground" who help them do their jobs in orbit, and sent good wishes to their friends and family members on Earth. "Christmas is traditionally a time for friends and families to get together," Peake said. "And although we can't be with our friends and families this year, we'll be orbiting the Earth 16 times on Christmas day, and sending all our good wishes to everybody back down on beautiful planet Earth." A Russian Progress cargo ship departed Monday (Dec. 21) from the Baikonur Cosmodrome launch site in Khazakhstan, carrying more than 2.8 tons of food and supplies. The vehicle arrived at the station on Wednesday (Dec. 23). A NASA representative told Space.com there is a small amount of space allotted for personal crew items, which might include some holiday gifts or Christmas treats. A close-up of the space station Christmas tree, snapped by Canadian astronaut Chris Hadfield during the Expedition 34 mission in 2012. The first American Christmas celebrated in space was in 1968, when the crew of Apollo 8 spent Christmas Eve circling the moon. The video broadcast of Jim Lovell reading from the Book of Genesis was seen and heard all over the world. The first American Christmas in orbit around the Earth was on board Skylab. The crew members built a "Christmas tree" out of used food cans. But celebrating the winter holiday season on the space station became a consistent tradition when humans began permanently occupying the orbiting outpost in 2000. The station is currently stocked with a few Christmas decorations, including a small tree and some stockings, according to a NASA representative. If you'd like to send a holiday card to a space-loving friend on your list, ESA is once again offering free cosmic holiday e-cards on its website. Kelly wrapped up the video message by saying, "Merry Christmas, happy holidays and happy new year from the International Space Station."